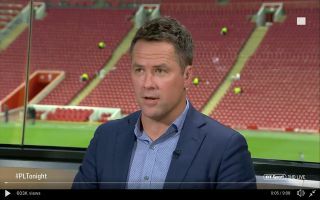 Michael Owen described the latter stages of his playing career as ‘turmoil’ as the star striker was unfortunately plagued with injury problems. Owen came through the youth ranks at Liverpool instantly turning into a hero for the Reds and England in the early stages of his career. Owen also played in the Premier League for Newcastle, Manchester United and Stoke. Here are Owen’s thoughts on his career in a lengthy interview with BT Sport yesterday that is well worth your time. Owen is regarded as one of the Premier League’s and especially England’s greatest striker ever, Owen scored a whopping 150 Premier League goals in his career. However, there’s no doubt the latter part of his career was far less inspiring than his breakthrough years for Liverpool and England. Something of a comical figure since retiring and becoming a pundit, it’s refreshing to see this different side to Owen as he speaks so candidly about his injury difficulties and how that affected him psychologically.